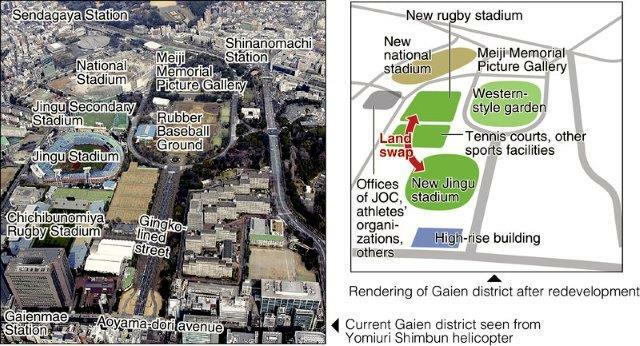 Jingu stadiums, the Chichibunomiya Rugby Stadium and other sports facilities in Tokyo’s Meiji Jingu Gaien district, where numerous historic matches have been held, are scheduled to be rebuilt after repeated land swaps, according to sources. The plans are part of the Tokyo metropolitan government’s redevelopment projects aimed at the 2020 Tokyo Olympic and Paralympic Games. By utilizing funds from the private sector, the metropolitan government aims to turn the district into “Japan’s sacred site of sports” — alongside the construction of a new national stadium which will be the main Olympics venue. Tokyo Gov. Yoichi Masuzoe signed a memorandum with Meiji Shrine, the landowner in the district, as well as others involved with promoting redevelopment of the Gaien district, on Wednesday afternoon. In line with the metropolitan government’s plan, Meiji Shrine will finance and conduct work to rebuild or replace facilities. Jingu Stadium was completed in 1926. In 1934, a Japanese representative baseball team played against a representative team of the U.S. Major League, including Babe Ruth. The stadium is currently the home turf of the Tokyo Yakult Swallows professional baseball team. The Tokyo Big 6 Baseball League, an intercollegiate baseball league, also holds matches there. The Chichibunomiya Rugby Stadium was completed in 1947 and used as a soccer venue for the 1964 Tokyo Olympics. The stadium has hosted many historic sports events. In 1989, for example, Japan’s national rugby team defeated Scotland — a rugby superpower — in a match for the first time. Redevelopment will be implemented in three stages. The rugby stadium will become a parking space for the new national stadium during the 2020 Olympics, and will also function as a disaster-prevention base. After the Olympics, a new baseball stadium will be built on the land where Chichibunomiya Rugby Stadium currently stands. After that stadium is completed, the old baseball stadiums will be demolished and a new rugby stadium built at the site. Professional baseball games will be held in old and new stadiums without a break. Rugby matches will be accommodated at the new national stadium as well as other venues until the new rugby stadium is completed. Covering about 17 hectares, redevelopment will last until fiscal 2025. In terms of land size, the planned work is larger in scale compared to that in Roppongi Hills, which covers about 12 hectares of acreage, and in Tokyo Midtown, which measures about 10 hectares.